Nintendo owners were flooded early on with dozens of simple sports games, none of which were very good. Recently sports fans have been treated with far superior games such as Ice Hockey and Double Dribble. This month baseball aficionados are getting the cream of the crop with R.B.I. Baseball, which has been developed by Namco and localized by Tengen. 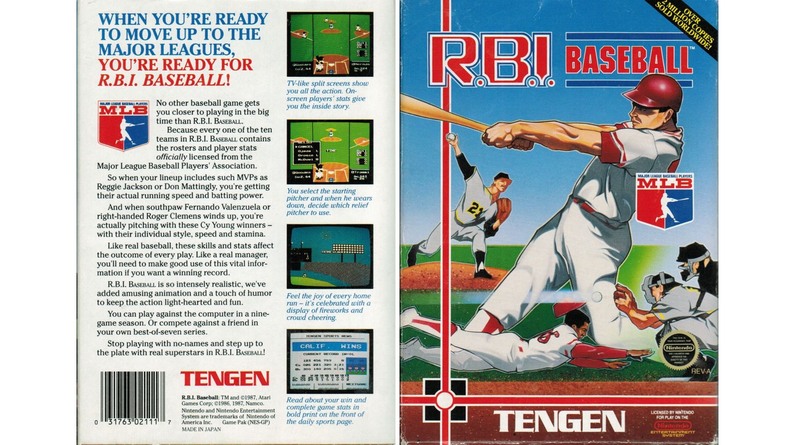 In April we were all let down by the poorly designed Major League Baseball from LJN, but thankfully R.B.I. trumps that game in nearly every way. In much of this review I’ll be comparing the two games. For starters, R.B.I. Baseball has been licensed by the MLB Players Association, but not the MLB itself. This means that no real teams, logos, or colors will be found here. So the New York Mets are simply called New York. However, each team is made up of sixteen players based on their real-life counterparts, so defending World Champions, Minnesota features stars like Kirby Puckett and Bert Blyleven. Although the statistics typically match a player’s skills and attributes, all of the sprites look the same and have the same build. Only the eight division winners of the last two years are present in the game, so if you’re a fan of the Phillies, Braves, or White Sox, prepare to be let down by this. There are also two All-Star teams made up of the best players in baseball not already on selectable teams. By comparison, MLB from LJN features all 26 baseball teams and more available players, but no player names. This is the one and only advantage MLB has over R.B.I. Attempting to play entire games of MLB was a chore. The gameplay was slow, sluggish, and unfair. Playing defensive was nearly impossible due to horrible game programming. It took forever to start a game due to the mandatory lineup setup. If that wasn’t bad enough, the graphics were terrible and the sound was even worse. Luckily R.B.I. is the polar opposite in every aspect. Lineups are preset so you can start a game instantly, either against a friend or the computer. Hitting, pitching, base running, and fielding are all easy to learn and the game controls well. The graphics are smooth and has none of the slowdown between hitting and defense that plagues MLB. Although there are some programming glitches that make the game unrealistic at times (bunt-doubles and inside the park homeruns are not unusual), the game resembles a real game of baseball. The game is colorful and looks very sharp, especially after playing MLB and Nintendo’s own Baseball. No attempt was made in differentiating the players, or making them look like themselves, but that didn’t hinder my experience playing the game. Although, how difficult would it have been to at least get skin tone right? The presentation is great throughout, and there’s even a scoreboard with stats after every half inning. A few songs are featured during the game, and the music is pleasant and suits it just fine for a sports title. This is much preferred to the awful silence and random baseball noises in MLB. I must also award great praise to the manual. Not only does it offer great detail about the game, but also it features a ‘Player Program’ and has the rosters and stats for each team and even assigns grades to the players based on skills. Some players really stand out, notably St. Louis’ Vince Coleman and his superhuman speed on the base paths. As much as I’ve enjoyed this game, it has its flaws and there is definitely room for improvement. Although playing defense is pretty smooth, it is not possible to dive to stop grounders, or to jump to catch fly balls. So many hits could be prevented if these everyday baseball moves were incorporated. The dream would be to add a battery in the game so you could have a season and keep real-time stats. Earl Weaver Baseball on the PC has features like this (although the gameplay of R.B.I. Baseball is so much better.) This would enhance the single player experience. Of course adding more teams and players would also be appreciated to satisfy all of the baseball fans across the country. For now R.B.I. Baseball rules the roost, but with other contenders like Bases Loaded just around the corner, time will tell which baseball game will be the champ. If you’re looking for another amazing game to play against friends and family, look no further. Having weekend mini-tournaments with Ice Hockey and Double Dribble has become a tradition amongst my friends and now R.B.I. Baseball will join in the fun. Whether playing alone against the computer or against friends – you’ll have a ball.